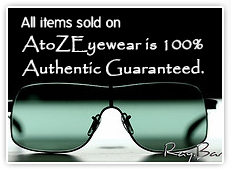 AtoZEyewear is the perfect place to buy Authentic Designer Sunglasses and Eyeglasses at lowest prices. Our mission is to guarantee the highest quality optical products from top designers in the world at the most affordable prices. We have partnered ourselves with top distributors in the industry to get the lowest prices possible on top quality and most fashionable eyewear in the world. We pass on our savings to our customers. All merchandise we sell is Guaranteed to be 100% Authentic. Our customer service personnel is trained to provide customers with accurate information in a courteous manner. They will work with every customer to get them the best price possible. Our mission is to provide customers with great service and products. Through many years of experience, we have learned that the best form of marketing is happy customers telling their friends and family about us. We have partnered with top laboratories in New York area to provide us with best quality optical lenses and craftsmanship for prescriptions. They use latest technology to manufacture and process our lenses for prescriptions. All prescription orders are inspected thoroughly prior to being shipped. Your eyes are important to you and to us and we do our best to take care of them.